For an artist who's made a name for himself mastering bear and bird buddy comedy, Nedroid creator Anthony Clark sure is modest. With his Livejournal-turned-Webcomic a fixture on social networking sites, Cracked.com and other traffic-churning electronic locales, along with a coloring gig on the celebrated "The Adventures of Dr. McNinja," one would assume Clark would emit some semblance of an ego. It's no small thing to train wild, potato-shaped animals to do one's bidding in semi-regularly updated adventures, after all. With this in mind, ComicsAlliance caught up with Clark for his take on Nedroid's progression from hobby to hot property, crafting characters in the digital age, and the link between positive content and positive feedback. ComicsAlliance: You've been posting comics online in various forms for the better part of the past decade. How would you characterize the progression of your Webcomics career up to this point? Anthony Clark: Well, I feel like any sort of "career" I have in Webcomics is just starting. Despite posting comics online for so long, it's only in the past year or two that my work has gotten much notice. It's new enough to me that I'm still baffled by the idea that I have fans, or that anyone would bother to send me an email just to tell me they like my comics. Some people will just sort of appear on the Internet out of nowhere and produce amazing work and become well-known in a short period of time. I'm more like the tortoise, because my approach is just slow and steady, and also because I have a shell. CA: It's been pretty interesting to follow the evolution of your artwork. Can you tell us a little about the path that brought you to your current approach to creating the site's regular content? What's kept you coming back to Beartato, Reginald and some of your other recurring characters? AC: When I first started posting comics online it was all about experimentation. I've tried almost any style or technique you can think of, and eventually it boiled down to the kind of loose, simple, bold-lined look I use today, simply because it's a look that I find appealing and it's one I can pull off without spending hours on it. In the same vein, my early comics had all sorts of different characters, usually unnamed, because the joke was in some absurd situation and the characters didn't really matter that much. I later began using Beartato and Reginald because when you have recurring characters and the readers can expect them to act a certain way, it opens up entirely new areas of jokes. Plus they are fun to draw and simple enough that I just scribble them out in the commercial breaks during reruns of "Diagnosis Murder." CA: Walk us through a typical day of art creation. What's your schedule like in relation to your various Webcomic projects? AC: I've never really been the type of the person who could make a schedule for himself and then follow it. That's one reason I've never claimed to have an update schedule; if I can't think of a comic that I think is funny, I'd rather go a few days without a comic than draw something I don't like just so I can update. So comics just come as they come. I'm sure this annoys some readers, but hopefully they'll agree that in the end a few good comics beats several bad ones. Working on Dr. McNinja is similarly loose; Chris will draw the page and send it to Kent, who will ink it and scan it and send it back to Chris, who cleans it up and sends it to me to color. Sometimes this happens days in advance, sometimes it happens at five P.M. the night before the page goes live. But in the end we always get it done! Then I spend the rest of my time either dealing with the "business" side of my comics (picking up prints, standing in line at the post office, breaking my website) or synergizing with the Webcomics community (read: wasting time on the Internet). CA: Though most of your comic strips aren't heavily rendered, you're an accomplished digital colorist and painter. What are some of your tools of choice when it comes to digital illustration? AC: My favorite program for drawing comics is one called Manga Studio. It's got the smoothest brushes I've found in any program and works beautifully with a pressure-sensitive tablet. If I'm coloring a drawing or a Dr. McNinja page I'll go to Photoshop, because it's got all the tools I need and over time I've developed a workflow that gives me good results. I'm also fond of a natural-media simulator called ArtRage, which is a lot of fun to just play around with when I'm in a painting mood. Hardware-wise, I've used various Wacom tablets over the past ten years. My first was a tiny Graphire that my parents gave me as a high-school graduation gift, which is probably one of the most useful gifts I've ever received. That served me well for about six years when I upgraded to an Intuos, and just last year I was able to move up to a Cintiq (which would be overkill if I were just using it for my simple comics, but it's very handy for paying work which has to look nice). 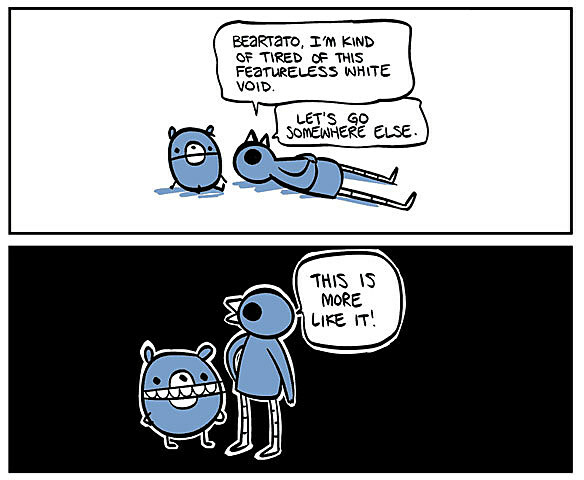 CA: One factor that helps make Nedroid.com so accessible is the fact that the humor is generally all-ages. Is the site's overall tone something you intended to maintain from the beginning or has it been shaped in part by reader reaction and your understanding of your audience? AC: It's mostly due to the fact that I myself tend to prefer goofy humor to anything shocking or mean-spirited. There are literally hundreds of other Webcomics where the jokes stem from characters insulting each other or being "edgy." And I'm not trying to say I'm above that; if it's done well, I'll laugh just as hard as anybody. But I don't think I could do it well. If a character offends another in my comics, it is usually through carelessness rather than malice. I've gotten several emails over the years from people who said that they were having a bad day and one of my comics helped cheer them up. That is an amazing thing to me! I feel hugely blessed that I am somehow able to help people smile during rough times and all I have to is draw some goofy pictures that I enjoy doing anyway. 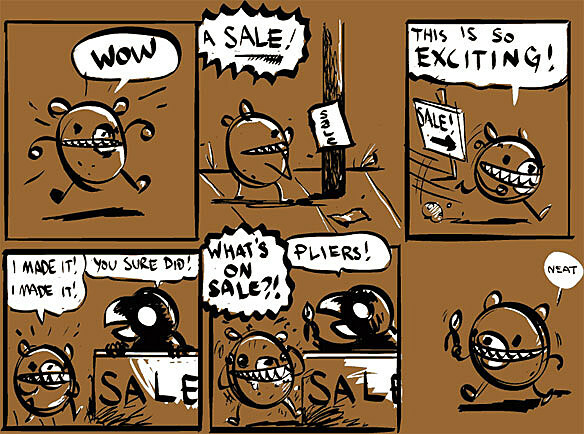 CA: While there are a few examples throughout Webcomicdom of sites that are more or less self-sustaining, monetized ventures, Nedroid seems fairly casual in its approach to selling merchandise (your FAQ section's reaction to the question about T-shirts is a pretty fun example of this). Are you a lifer when it comes to comics or is it more of a passion that rounds out other artistic aims and career pursuits? AC: I really don't have any career goals besides comics. I have such a great time doing them, plus I don't have any other marketable skills. I'm definitely not averse to making from comics, but I've never been what you would call business-savvy. However, I've recently started working with a well-known Webcomics company to start offering some merchandise (which may be available by the time this interview runs), so that's very exciting to me. CA: The fairly strong sense of community in the Webcomics world can be a blessing and a curse for creators. How do you think your relationship with your readers has fared over time? AC: I've always thought I have a great audience. I think my comic tends to attract a good-natured type of reader. People who thrive on fighting and anger probably won't find much in my comics to interest them. In addition, I have a lot of creative readers. I started out posting my comics on Livejournal many, many years ago, and the only reason I keep posting comics on there as well as my proper website is the community of readers I've built up over time, many of whom will post their own drawings in the comments. My favorite thing is when a reader and I can get into a zone and draw back and forth and just riff off of each other for a while. It also allows beautiful things to happen spontaneously, like what grew out of the comments to this entry. 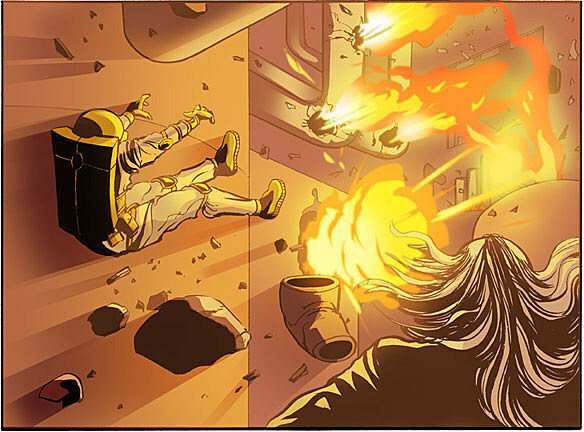 CA: When it comes to being part of "The Adventures of Dr. McNinja" crew with Christopher Hastings and Kent Archer, do you dig the collaboration as a way to cut loose and color? Have you found that it helps your outlook as a solo creator in your own right? AC: Yes, the collaboration is great, especially with some of the subject matter I get to work with. It's a lot of fun coloring evil unicorns and mysterious time travelers. I also get to do special effects; Chris will just make a note saying the panel needs an explosion or some shrieking ghosts, and I get to go wild. I've taken a lot of the techniques I've learned and developed and incorporated them back into my own projects as well. Chris also has much more experience with the business side of the Webcomics world than I do, so he's always helpful whenever I need some advice. CA: One piece of advice creators in any medium seem to advocate is drawing inspiration from outside your immediate endeavor. What are some of your non-comics sources of inspiration/things you enjoy? AC: I don't really have any interesting hobbies or areas of expertise to tap into for my comics. Art has always been my hobby, and even though I now make money doing it, I still also draw for fun all the time. I try to be open to inspiration whenever it comes, but the truth is I get most of my ideas by taking old "Nancy" comics and changing the names, characters, settings and events. CA: Convention season starts up here in a few months. Have you made any plans to hit any specific shows this year? AC: I'm still pretty new when it comes to conventions so I'm sort of easing into it. To this point I've attended the Small Press Expo for the last two years and that's it. I definitely plan to be there again this year. I'll also be at HeroesCon as a guest at Indie Island in June, and if possible I'd love to attend the next New England Webcomics Weekend. Cons are scary things but also very exciting! CA: Do you have any surprises in store for Nedroid readers in the near future? What can your fans expect in the coming months? AC: I don't have a clue! I can barely plan ahead a few days, let alone a few months. Plus I'm wary of making promises because I tend to have more enthusiasm for new projects than I do persistence to actually finish them. That said, "BEARTATO THE MOVIE" starring Gilbert Gottfried and Chris Elliott. Bigger than "Avatar." You'll see.